Mung beans are the tiny seeds of a bean plant, commonly sprouted and eaten and among the most popular sprouts in the world. They are commonly found in Asian cuisine. Dried mung beans have a long shelf life and can be sprouted relatively quickly. The total time required for mung beans to grow from seed to final maturation, when the plant will produce more seeds, is between 90 and 120 days. The life of a mung bean begins with a seed. Each seed contains a tiny section known as the germ, with genetic material stored within. This is where the plant begins to grow from. Food in the form of starch is also stored within the seed. The inside is protected by hard coat over the seed's entire surface. 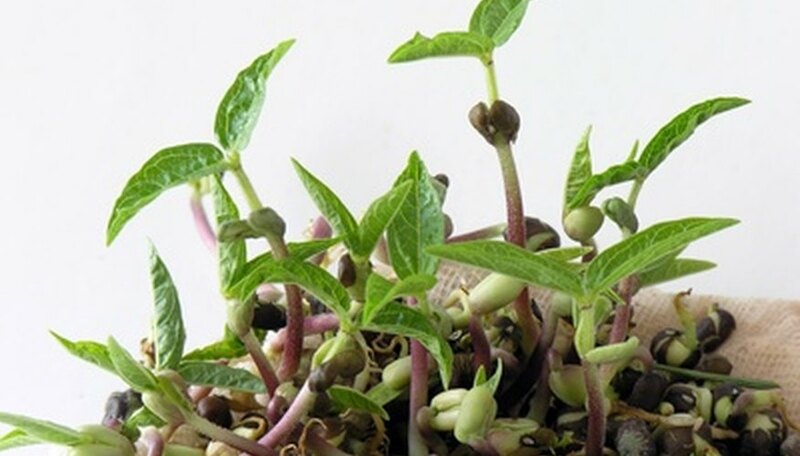 Mung bean seeds usually take between two and five days to sprout. Moisture is the trigger--as the seed absorbs water, the germ will begin to grow, and the seed coat will soften and split. The germ will first produce a long, pale yellow to white root. At this point, mung beans are often harvested for food as bean sprouts. The crunchy roots are often eaten raw or used in cooking. If meant for cultivation, the root will grow into the soil and produce branching root hairs that gather water and nutrients. As the plant continues to grow, it will produce a short stem, reaching up from the soil, containing two seed leaves called cotyledons. These tiny leaves contain stored starches and sugars that will feed the plant until it is established. As it matures, the plant will put forth stems that will grow either as indeterminate plants that grow as vines or terminate plants that grow in bush form. Each will grow from 1 to 5 feet in length. The plant will produce leaves along each branch; they are compound, with three leaflets each. The root system will continue to branch and grow throughout the soil. It will also form nodules that contain nitrogen fixing bacteria, which lives in a symbiotic relationship with the plant and can fix nitrogen directly from the atmosphere, which is then made available to the mung bean plant for growth. As the plant matures, small, pale yellow flowers will appear in clusters of 12 to 15 toward the top of mung bean plant. The flowers are self-pollinating and do not require wind or insects. Pollen, the male portion of the plant, forms as grains at the end of an organ called the anther. When pollen comes in contact with the female portion of the plant, known as the stigma, sperm is released. The sperm travels down through the stigma into the ovary, where fertilization occurs. Once fertilized, the flower will fall away and a bean pod will begin to form. At maturity, the pods are between four and five inches long, vary in color from yellowish brown to black and contain between 10 and 15 small seeds. The seeds vary in color from yellow to brown or green depending on the variety of mung bean. The pod will eventually dry, at which point the seeds can be harvested. If left unharvested, the bean pod will eventually split open to release the seeds and begin the life cycle again.